Having qualified for countless live finals, Dan Gaspar (MrTuttle05) knows what it takes to win in DFS. In this space each week, he’ll guide you through the lineup building process for both cash games and tournaments by going in-depth and giving out his “Tuttle’s Take” for every game on the main slate. I have a confession to make. My best ball life depends on the Chiefs sucking. Admittedly, I don’t feel great about it. As always, Patrick Mahomes is QB1 in terms of raw projection, but he’s not making my cash game builds because of his high price tag. 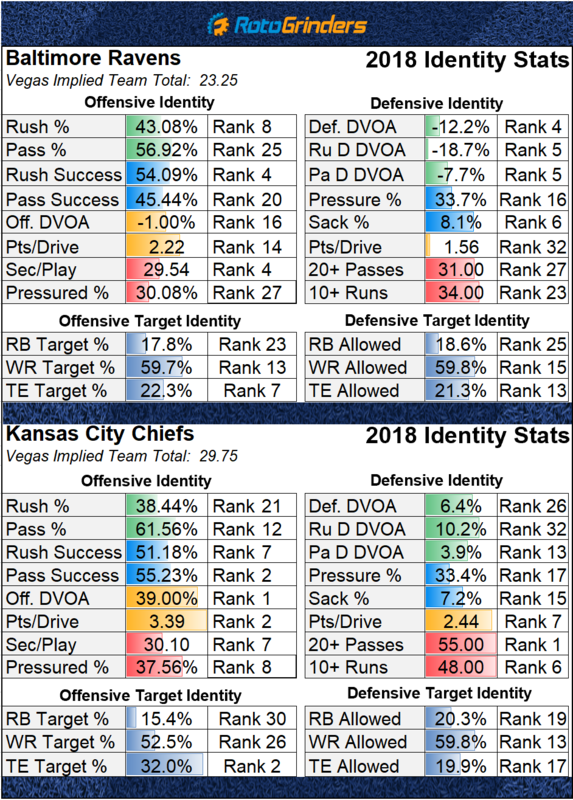 Tyreek Hill seems to be getting a lot of hype this week from the defenses don’t matter crowd, but I’m unlikely to have any exposure to him, even in GPPs. Travis Kelce is a cash game play on DraftKings – he’s a bit tougher to squeeze in on FanDuel where Eric Ebron headlines the cash game options at the TE position. 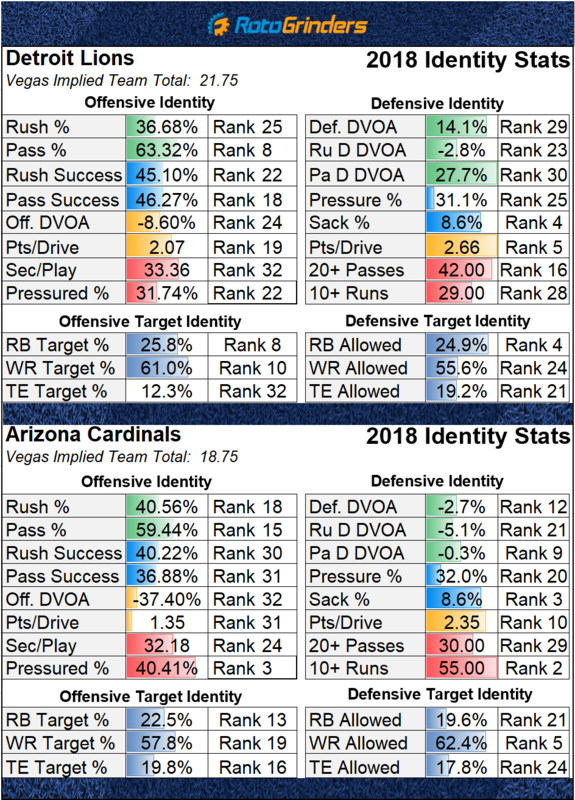 The Spencer Ware chalk almost crashed and burned last week and one thing we learned is that he doesn’t have as much of the running back workload as we would like. He’s an easy fade for me this week against the Ravens. Lamar Jackson will grab the start once again for the Ravens which immediately makes all Baltimore pass-catching options unplayable while Jackson is best reserved for GPPs. Gus Edwards is who we thought he was – a high volume rusher with no involvement in the passing game. Edwards is best used when the game script will be positive. Although a positive game script seems unlikely this week, I am still ok using Edwards in GPPs as he has 20+ touch upside in a matchup against a Chiefs defense that ranks dead last in rush DVOA. Ty Montgomery did see seven targets last week as the Ravens pass-catching running back, but remains too thin of an option for GPPs on a week stacked with value options. TY Hilton is considered a true game-time decision and his availability or lack thereof will dictate how we can play this game. If Hilton plays, this game is one of the more attractive game stack options on the slate. If Hilton is unable to go I have some concern about the Colts keeping pace. Eric Ebron is one of the top tight ends on the slate and can be considered in all formats – he’s my #1 cash option on FanDuel. I’m only interested in playing Marlon Mack in games where the Colts are favored. 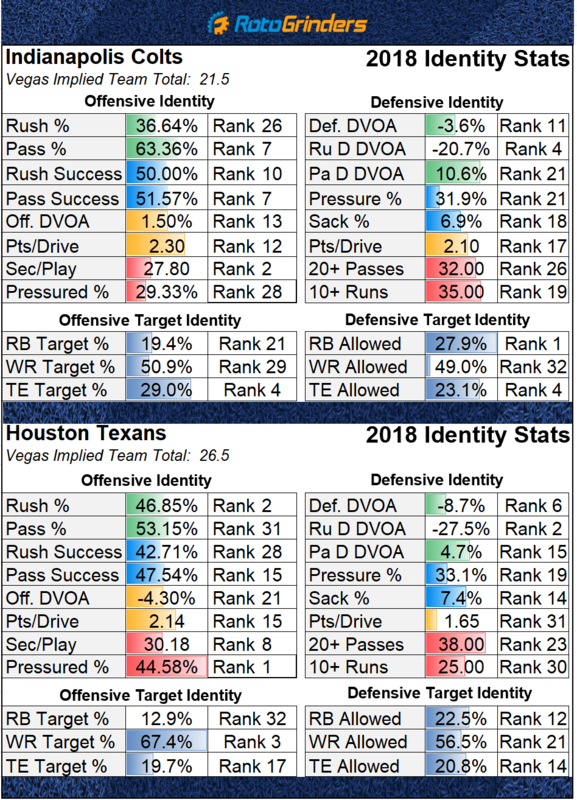 I’m a fan of Deshaun Watson and DeAndre Hopkins stacks in GPPs. You could make the argument that Hopkins is a fringe cash game option this week and I wouldn’t argue with you. Keke Coutee is a game-time decision who is trending in the right direction. Coutee can’t be used in cash games, but would be my preferred secondary Texans receiving option if looking to double stack Watson in GPPs. I’m good on Demaryius Thomas. Scam Newton has a shoulder injury and looked terrible in a strong matchup against Tampa Bay last week. He could have his hands full once again on the road against a Browns defense that ranks fourth in pass DVOA. The path to a Panthers win seems to be riding CMac to the ground. Christian McCaffrey should be heavily involved once again this week, but he’s priced as RB1 on both FD and DK. I actually feel more confident in Saquon Barkley this week which has me using McCaffrey more as a secondary play. DJ Moore should continue to see lots of targets – especially with Greg Olsen sidelined for the rest of the season. Moore has at least eight targets in each of the last three weeks and catches a break with Denzel Ward being sidelined for the Browns. I like Moore in GPPs. I don’t think any Cleveland player is playable in cash games this week, but I do essentially like the whole roster for GPPs. Nick Chubb should see a heavy workload and has shown involvement in the passing game. 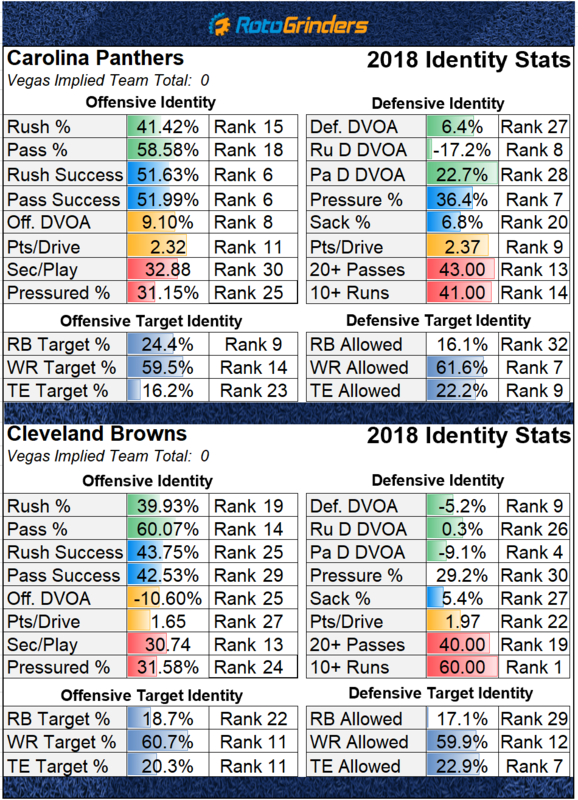 I like pairing Chubb with the Browns defense as a correlation play in tournaments. Jarvis Landry finally topped 100 yards last week and gets a strong matchup in the slot against Captain Munnerlyn. 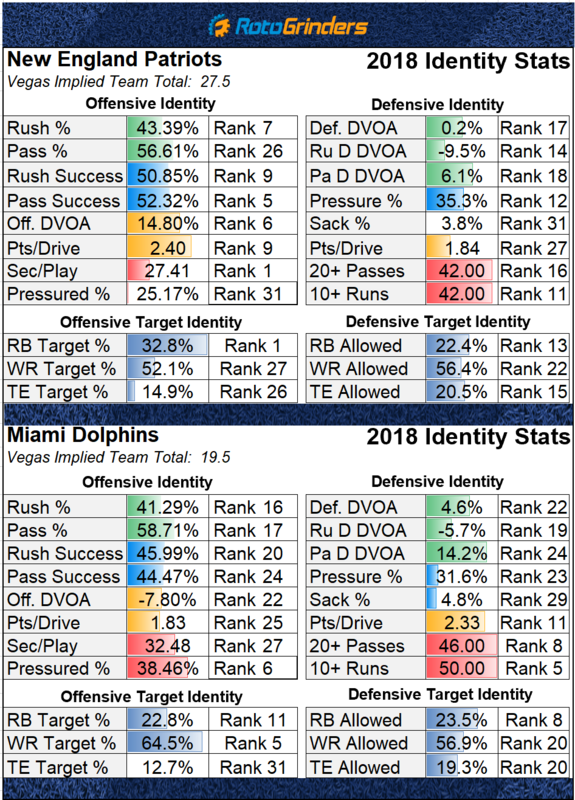 The Panthers have also been poor at defending the tight end position this year ranking 31st in DVOA which puts Njoku firmly in play in tournaments. Njoku would be considered a cash option for me if I didn’t think Kelce and Ebron were such strong options. Peace out Mike McCarthy. 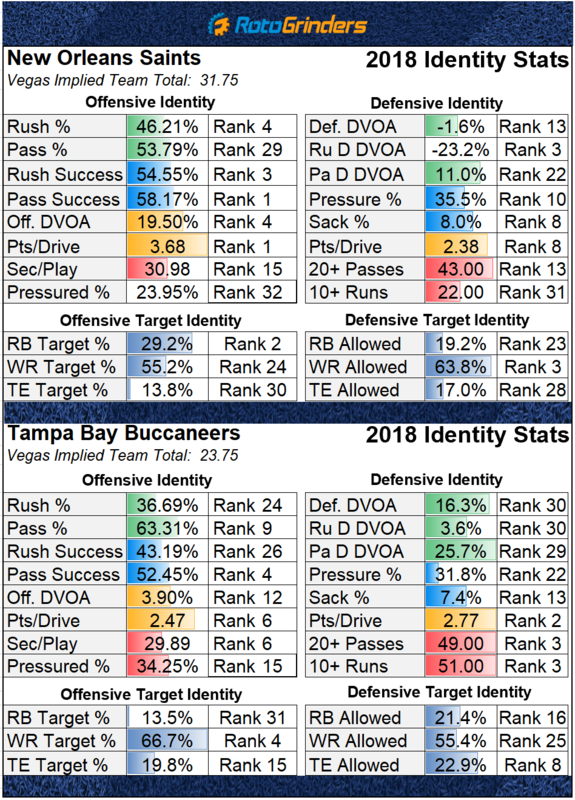 The Packers offense has looked stale all season and while I’m not confident that Joe Philbin is an actual upgrade to McCarthy it certainly would be tough for this offense to play worse than it has been. Word out of Green Bay is that Aaron Rodgers will have more control over the offense which not only means good things for himself and the passing game, but also for Aaron Jones – Rodgers has long held the stance that Jones should be the Packers RB1. Aaron Rodgers is an option in all formats and I am considering him in cash games. 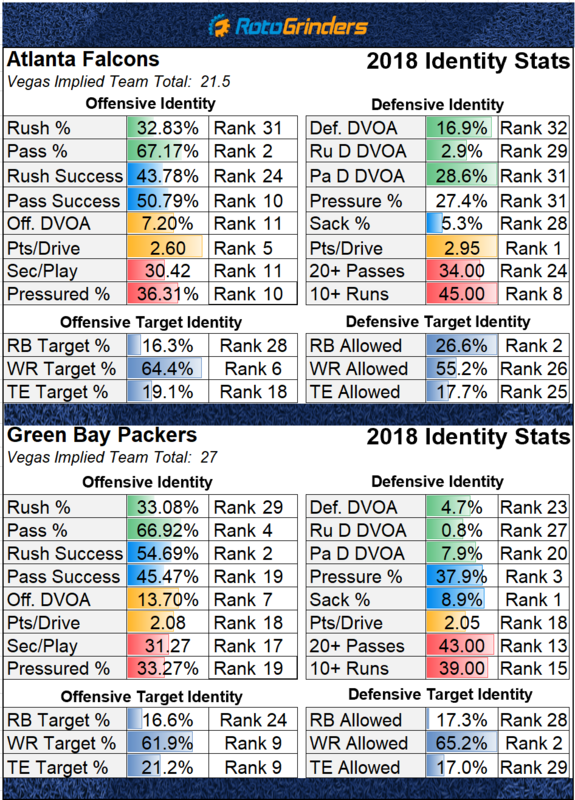 Aaron Jones is best used in GPPs as his workload is still up in the air. Davante Adams volume has been amazing all year and is also in cash game consideration. DFS twitter favorite Marquez Valdes-Scantling can be used in GPPs. Julio Jones is banged up and my hope is that keeps his ownership low – RotoGrinders ownership projections have Julio at 17.5% owned which seems a tad high. Julio isn’t a cash game option but I do like him in game stacks. Notably, the Falcons team total has risen almost three points since the beginning of the week and this game has one of the top totals of the week at 51. While I am not overly concerned about Julio’s injuries I am somewhat concerned about the possibility of Jaire Alexander following him around. If Alexander did shadow Julio that would open up targets for Calvin Ridley and Mo Sanu – both viable GPP options if stacking this game. New Orleans opened as 8-point favorites and are now up to double-digit favorites at some books. You guys know what that means – running and lots of it. This is a favorable matchup for the Saints passing game and the likes of Drew Brees, Michael Thomas, and Alvin Kamara, but volume has to be a serious concern if the Saints jump out to an early lead. All three guys are best left for GPPs and really best used in game stacks as the Bucs will need to put up points for the Saints passing game to pay off their price tags. I would have more interest in Mark Ingram if the running back position wasn’t stacked with value options this week. Ingram is another Saints player best used for GPPs and does have a shot at 15-20 touches if game script breaks his way. Adam Humphries draws the best on paper matchup for the Bucs in the slot against PJ Williams. Humphries has been surprisingly consistent in the second half of the season. While he’s not a guy that I’ll have exposure to I do think Humphries can be used as a secondary option in all formats. I prefer Chris Godwin to Humphries and Godwin actually comes at a $900 discount on FanDuel. DeSean Jackson has missed three games over the last two seasons and Chris Godwin’s lines in those games: 3-98-0, 7-111-1, 5-101-1. If the Saints use Marshon Lattimore to shadow Mike Evans that could open up some nice looks for Chris Godwin against Eli Apple who has struggled mightily at times this season and has given up 15 receptions on 20 targets over the last two weeks for 189 yards. Evans got the best of his matchup with the Saints in their Week 1 matchup as he caught all seven of his targets for 147 yards and a touchdown. Evans is also a GPP only option. I am not sure there is an offense as good as the Patriots that I feel so “meh” about from a fantasy perspective when they are fully healthy. There are too many mouths to feed. Rex Burkhead was active last week for the first time since Week 3 which actually hurt Josh Gordon who was often replaced by Burkhead on third down. Gordon owners (I was one) ran pure to get the production they did last week out of Gordon on three targets. Gronkowski once again ran the second most routes on the team, but was only targeted four times. While I’m not interested in Gordon, or any other Pats wide receiver, in any format, I’m still willing to chase Gronkowski in GPPs just because I do think a two-touchdown performance is still in the realm of possibilities. Sony Michel has 38 carries in the last two weeks, but has little involvement in the passing game – he’s just an ok GPP option that I am not likely to have exposure to. Theoretically the Dolphins passing game (Ryan Tannehill, Kenny Stills, Kenyan Drake, DeVante Parker, Danny Amendola) should see plenty of volume as big home dogs, but I’m not overly interested in rostering any Dolphins player on a full slate. If I were forced to choose a Dolphins receiver to play it would be Stills. UPDATE TO THE UPDATE: Pace of play combined with poor weather caused me to swap my RB rankings around: I now have Barkley ranked behind both Christian McCaffrey and Ezekiel Elliott. UPDATE: Odell Beckham has been declared out for this game. This reinforces Saquon as my RB1 this week. Sterling Shepard becomes an interesting secondary target across the industry – I would rank him behind Godwin but in front of Sutton. Evan Engram is also now in play but moreso as a secondary/GPP option. You can safely avoid Mark Sanchez and all Redskins players this week. 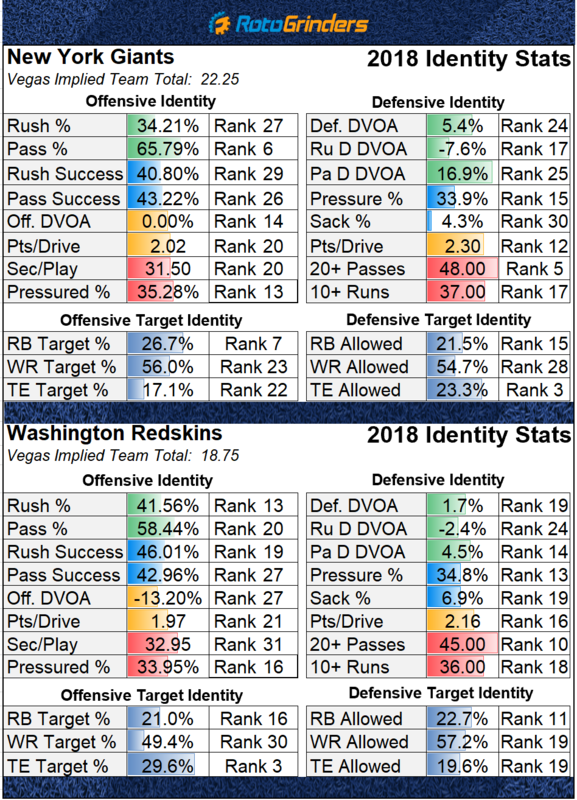 Chris Thompson is the only Washington player that jumps out as having any sort of upside, but I’m unlikely to have any exposure to him. I have Saquon Barkley projected as my RB1 this week which immediately puts him in play in all formats. 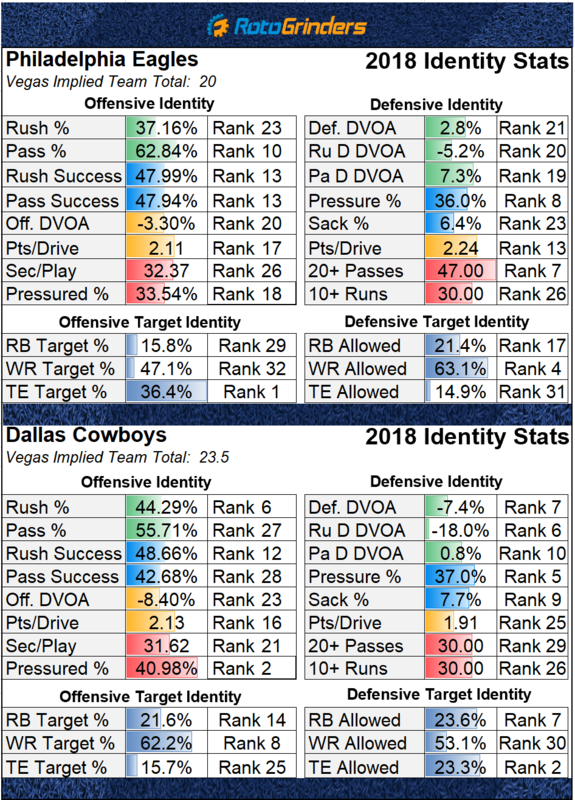 The Giants are four-point road favorites against a Redskins defense that ranks 24th in rush DVOA which should translate to a heavy workload for Barkley who is coming off a 24 carry home victory against the Bears. Odell Beckham is the only other Giants player I have any sort of interest in and he’s best used in GPPs. Emmanuel Sanders tore his Achilles in practice earlier this week which thins out an already thinned out Broncos receiving corps. Denver is now left with Courtland Sutton, DaeSean Hamilton, and Tim Patrick as their top three wide receivers with Matt LaCosse running routes at tight end. Sanders’ absence leaves behind a 27.6% target share and 38.2% market share of air yards over the last four weeks. It’s fair to think the Broncos will lean more heavily on the run going forward, but Sanders absence still boosts the value of Sutton et all to some extent. This is a good matchup for opposing passing games as long as the 49ers rank 26th in pass DVOA this year. The main San Francisco cornerback to avoid is Richard Sherman who has lined up on the left side of the field on 97% of his snaps. That’s good news for Courtland Sutton who should be able to avoid Sherman’s coverage on roughly 75% of his snaps. Sutton is the only Broncos wide receiver that I’m considering and he’s a secondary cash game option. Phillip Lindsay is a weekly GPP option. Marquise Goodwin is expected back, but Pierre Garcon is out once again for the 49ers. The Broncos own the second-ranked pass defense per DVOA, but did lose top cornerback Chris Harris Jr to injury last week. Despite Harris’ absence, I’m not overly interested in attacking this Denver secondary. 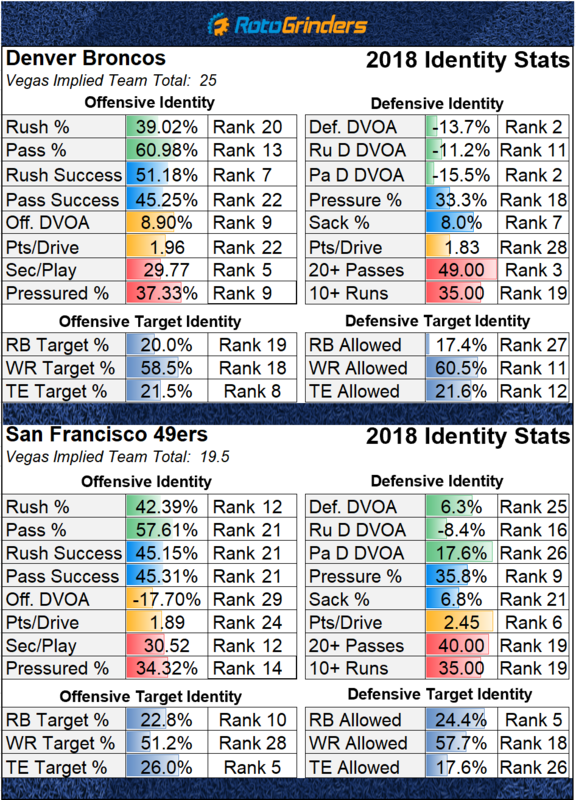 The only passing game option in play on San Francisco is George Kittle and he’s best used in GPPs. Matt Breida tweaked his ankle in warmups last week and was only able to gut out 10 total snaps. In came Jeffrey Wilson Jr. who carried the ball 15 times for 61 yards and also caught eight of nine targets for 73 yards. Wilson Jr. is expected to be the lead back once again in Week 14 and seems to be locked into a strong workload even with Alfred Morris expected to be active. Wilson has the toughest matchup of the cheap running back options this week, but I feel most confident in his workload – he’s a strong DFS play this week and an option in all formats. A Jeff Driskel led, A.J. Green-less Bengals offense on the road against a top ten Chargers defense – I’m going to pass. Austin Ekeler chalk disappointed mightily as he drew the Week 13 start in Melvin Gordon’s absence. Ekeler was on the field for 78% of the Chargers offensive snaps, but only totaled 43 yards on 18 touches. 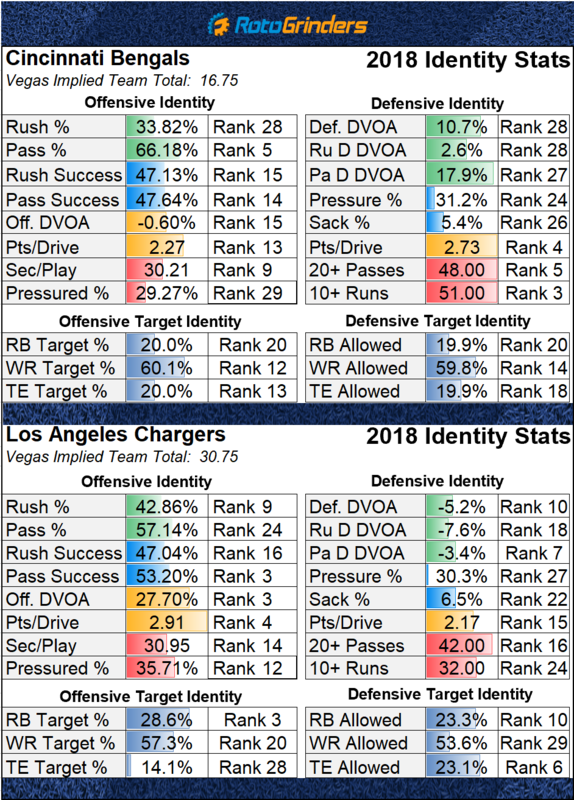 Rookie back Justin Jackson looked like the most effective Chargers back in the limited snaps he got and coach speak is in his favor as San Diego head coach Anthony Lynn said that “You might see Justin play a little bit more, you might see Newsome play some this week.” DFS Twitter has taken this quote and ran with it while I’m a bit more skeptical. I think an optimistic touch projection for Jackson would put him at 11-12 carries which still makes him just the third best value RB on the slate. Coach speak combined with Ekeler’s primetime let down has the Chargers lead back entering the weekend with an ownership projection in the 2-5% range. If Ekeler is really going to be that low owned then I want to have heavy exposure in GPPS as this still sets up as a spot for him to get double-digit carries and 6-10 targets. Ekeler is arguably worth his price tag based on projected passing game volume alone. Keenan Allen is coming off a 19 target performance against the Steelers and is Week 14’s top wideout play. He is a core option. This game has the second lowest total on the slate and the Lions’ league slowest situation-neutral pace has greatly limited the number of plays both the Lions and their opponents are able to run on a weekly basis. A low number of plays means less room for error. The only player I’m considering in this game is David Johnson whose price has come down across the industry. Still, DJ is a GPP only option. Ezekiel Elliott is a top three running back this week and I’m a bit afraid that I’m not going to have a whole lot of exposure to him as I do prefer both Saquon Barkley and Christian McCaffrey if spending up at the position. While I do have two RB’s ranked above Elliott I do still think he can be considered in cash games. Playing two high priced running backs will lead to unique lineup construction and is a viable GPP strategy this week. Amari Cooper has been a fairly consistent producer for the Cowboys and showed his upside on Thanksgiving when he exploded for eight receptions, 180 yards, and two touchdowns. I think Cooper is largely being overlooked this week and makes for a good tournament play as I would expect his ownership to be in the single digits. Josh Adams has continued lead back duties for the Eagles, but the combination of an increased price tag and tough matchup don’t have the undrafted rookie on my radar. I also don’t have a whole lot of interest in the Eagles passing game as top option Zach Ertz ranks clearly behind Travis Kelce and Eric Ebron. Golden Tate has seen increased involvement since being traded, but still isn’t seeing a big enough workload for me to consider him in any format. Ahhh, finally, my favorite team of the week. I am all-in on the Steelers. James Conner’s absence opens up the door for Jaylen Samuels and Stevan Ridley to split snaps at the running back position. Samuels expected involvement as a receiver makes him the superior option and one of the top value plays of the week, but my excitement isn’t for Samuels, it’s for Roethlisberger, JuJu and Antonio Brown. The Steelers are already one of the most pass-heavy teams in the league and the absence of Conner should only reinforce their dedication to the pass against an Oakland defense that ranks dead last in pass DVOA and is unable to generate any pressure on the QB. I think that both JuJu and AB84 will be used as an extension of the run game as the Steelers look to get both guys involved with short passes. Double-digit target projections for both players are realistic and they rank first and second this season among WR’s in yards after the catch. Big Ben is a top cash game quarterback option for me. JuJu is priced too low on FanDuel which puts him in play for cash games there whereas he’s more of a secondary option on DraftKings. Antonio Brown’s high price tag makes him best used in GPPs. Oh, and James Washington is a Tuttle’s Terrible Take this week – play him in a Milly Maker lineup. 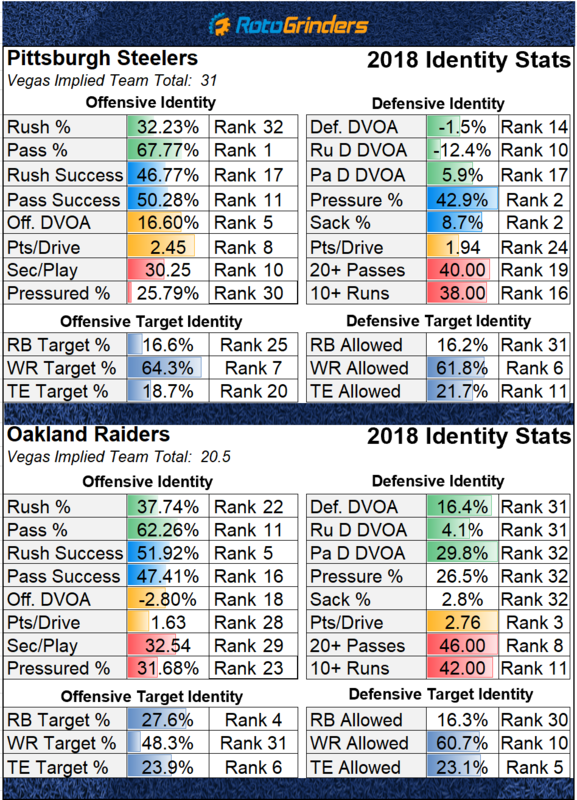 I don’t have high hopes for this Raiders offense, but am looking at using one of Jared Cook, Jalen Richard, or Marcell Ateman in game stacks. Cook is my favorite option of the trio as the Steelers have been poor against the tight end position this season – they rank 28th in DVOA in defending TE’s. Richard could see his touch projection increase if Doug Martin is unable to play this weekend – he’s currently questionable with a knee injury.